These fine, solid, stone semi-detached houses were built by the local authority well before the second world war. They have big gardens front and rear with well grown trees down one side of the street. Many residents take great pride in their gardens. All of Kingsway is a one way street. Approach off Bollington Road, opposite Moss Brow. It then curves round to the right and rejoins Bollington Road. Leads to – Princess Drive. 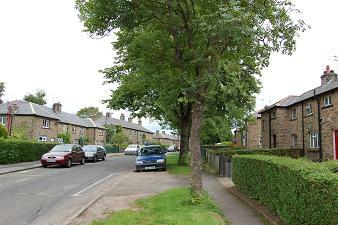 Nearest shops – Ovenhouse Lane, Bollington Road.